BBK Worldwide Global Headquarters | SIGNET Electronic Systems, Inc. Founded in 1983, BBK Worldwide (BBK) is the recognized global leader in patient recruitment. The company is renowned for accelerating time to market for new and improved medicines and treatments. Through its partner companies, TCN Technologies and Agency320, BBK offers the industry the most sophisticated technology, creative, and media services. BBK decided to relocate its Massachusetts-based headquarters in response to rapid growth and future expansion plans. The new space coincided with a milestone anniversary for the company, celebrating 30 years in the industry. The global headquarters was designed to foster the translation of ideas into innovative, more effective solutions for clinical trial challenges. Mobile and social technologies, and the ability to access information anytime, anywhere, was key to the design. BBK’s goal for the new 11,500-square-foot facility was to facilitate immediate collaboration. 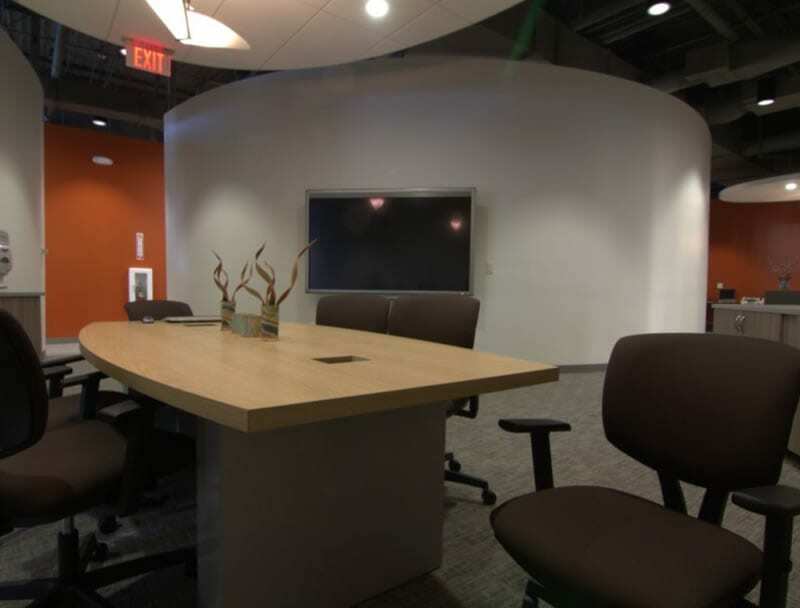 Through the unique design, staff is presented with a menu of collaboration spaces. The structure allows different teams and parts of the organization to interact like never before. From large networking and gathering areas to smaller, relaxed areas with couches, the headquarters comes equipped with various working options, all embedded with multimedia technologies to foster engagement and insight – in person and online. As the first tenant in the space, the project required an integrator to build a technological infrastructure from scratch. The plan needed to seamlessly integrate technology for employees to foster various working options. To support the fostering of ideas, creation, and innovation, BBK chose SIGNET as its integration partner. SIGNET recognized immediately that the core purpose of the audio/video systems was to facilitate instantaneous sharing of information and ideas. Through an extensive needs analysis process, working closely with BBK’s senior management to understand their vision, SIGNET created a forward-thinking, collaboration-based systems design. Using the latest technology, SIGNET was able to enhance the existing workflow to achieve the truly collaborative environment that BBK was seeking. Throughout the new space, SIGNET implemented Sharp AQUOS BOARD digital whiteboard displays. The displays came complete with a built-in PC and wireless Internet access to allow for the creation of documents and sharing of ideas, all centrally stored and instantly accessible. To enhance the collaboration of conference areas, six (60”- 80”) Sharp AQUOS BOARD digital whiteboards and Crestron keypads were added to simplify control Additional HDMI input plates were provided to allow user-supplied PCs to be displayed on the system.